We have been observing Air Jordan releases happening like crazy, and I am not mad about it one bit. Patent leather upgrades to our favorite Jumpman silhouettes have seemingly become a trending topic. From the Air Jordan 4 'Hot Punch' to the highly anticipated Air Jordan 1 'Blue Chill' - we are anxiously awaiting what's next on the drawing board in Oregon at Jordan WMNS division. Then we came across some sneaker leaker info, and personally I had to catch my breath. I was extremely lucky to grab the Air Jordan 1 'Gold Toe' patent leather joints off SNKRS one fine Saturday. With that being said, I am a fan of the shiny sneaker aesthetics. Thanks to the innanets, we came across a rumored WMNS exclusive to hit the shelves in the fall. 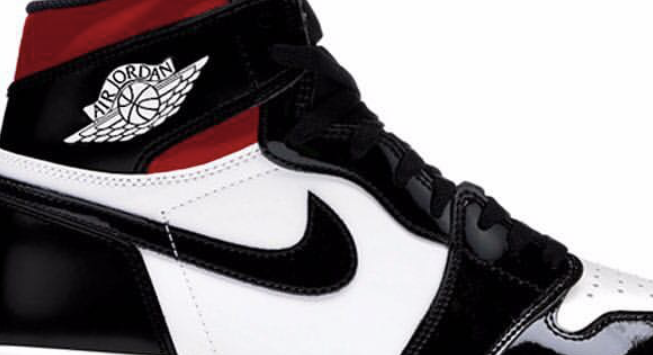 This Air Jordan 1 High OG is dipped in patent leather with similarities to the classic black toe colorway. Small differences at sneak peak show us that the heel is wrapped in black along with the ankle strap versus the black toe rocking the red. With the white base and primarily black details, a red lace swap would make these pop even more. Stay on alert as we get more details after summer. These are slated to have a price tag of $160 USD. Stay tuned shawties!